Saint Arnold Spring Bock poured up with minimal head. The color is nice, but hazy and full of particulates. The aroma has a rich maltiness, but it is not over stated. The taste has a mild sweetness. There is very little bit of bitterness in the finish. Overall, it is very enjoyable summer beer as it is not too heavy and not too sweet as a spring or summer bock should be. 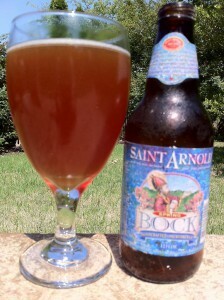 This entry was posted in Brews and tagged Saint Arnold by Brian Allen. Bookmark the permalink.